Though MTV’s Video Music Awards get sidetracked almost every year by some (occasionally pre-planned) controversy—Eminem challenging Moby to a fight, Kanye West stealing the mic from Taylor Swift, that whole Miley Cyrus/Robin Thicke thing—the show is actually supposed to be about giving awards to people. 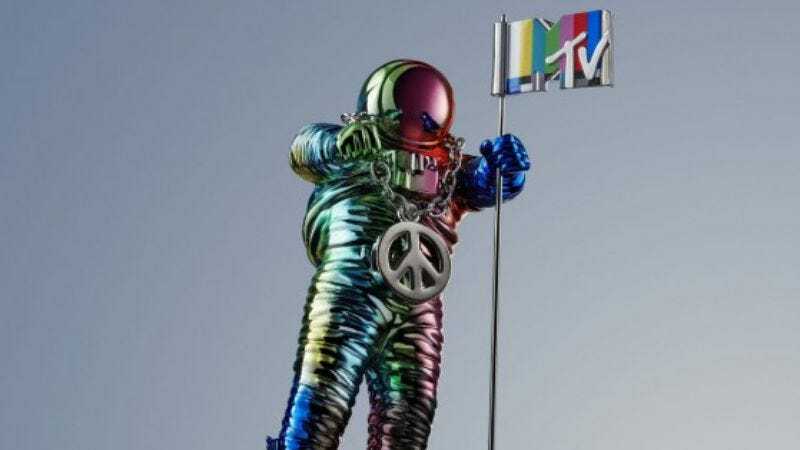 Cyrus herself is hosting the VMAs this year (imagine that), so in honor of what will certainly be another controversial show, MTV has commissioned fashion designer Jeremy Scott to design a new, colorful version of the iconic “Moonman” statue. A completely silver astronaut is, like, totally ’80s. MTV’s too hip for that now. The basic shape of the new statue is similar to the old one, with an astronaut holding an MTV flag. But the redesign replaces the silver astronaut with a bunch of shiny colors. His flag also now features a take on the old-fashioned TV test pattern, which Variety explains is “a way to reference the past way of watching TV as we continue to move into an age of digital consumption.” Finally, the Moonman has a big peace sign hanging from his neck, which is “meant to ask fans to foster an idea of unity and understanding, while also giving [the] statue some rock star bling.” In other words, it’s basically MTV’s whole shtick, condensed into a single, tiny necklace. You can see a video of Miley Cyrus waving the new statue around below—though she’s actually waving her middle fingers around and the statue is just covering them, because Miley Cyrus is edgy like that. The VMAs will air on MTV on August 30.